Two weeks after the devastating floods in San Jose, dozens of families were still spending the night in a shelter and facing an uncertain future. Their flood-ravaged homes along the Coyote Creek remain red-tagged or yellow-tagged. They have little money and few options, and they feel stuck. The number of victims at the Seven Trees Community Center shelter was hovering around 200, and the people there say they need long-term help. Two women there, who wished not to be identified, spoke with NBC Bay Area about their plight. "I have lost everything. I have nothing," one flood victim said. 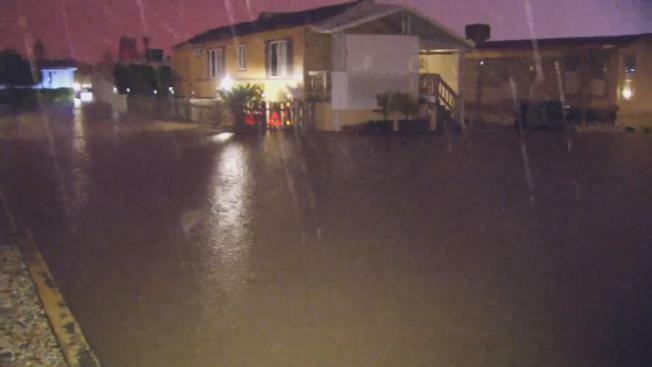 The rising Coyote Creek that flooded their homes two weeks ago was still fresh in their minds. "It's something that I never, ever dreamed of to happen, but it happened," another victim said. The two women said they've spent every night since the flood at a shelter. "We have no choice," the second victim said. "It's here or the street." The stress is mounting and has taken a toll on vctims' health. "I had to go to the ER the first couple of days because my stress level was high, my blood pressure was high," the first victim said. The emotional toll also continues, as many victims have had to miss work and are wearing old clothes and shoes. They need essential items. "It's really hard. I'm scouring for stuff to wear," the second victim said. "I never imagined I would do that in my life." On Tuesday, the city announced the nonprofit organization Home First will run the shelter at Seven Trees. Next week, case workers will begin working with the families on long-term plans. "Right now, we're dealing with folks who have severe barriers to getting back to their housing," said Ray Bramson of San Jose's housing department. "There's either severe damage to the apartments they were living, in or they've lost a vehicle, they've lost primary income." While the streets have cleared, people at the shelter were still looking for a path forward. "I'm not looking for as much of the material replacement as a place to go because the housing market here is already quite small," the first victim said. The city said the best way to help is to donate to the victims relief fund. Officials ensure that every penny will go directly to the victims. So far about $200,000 has been doled out.